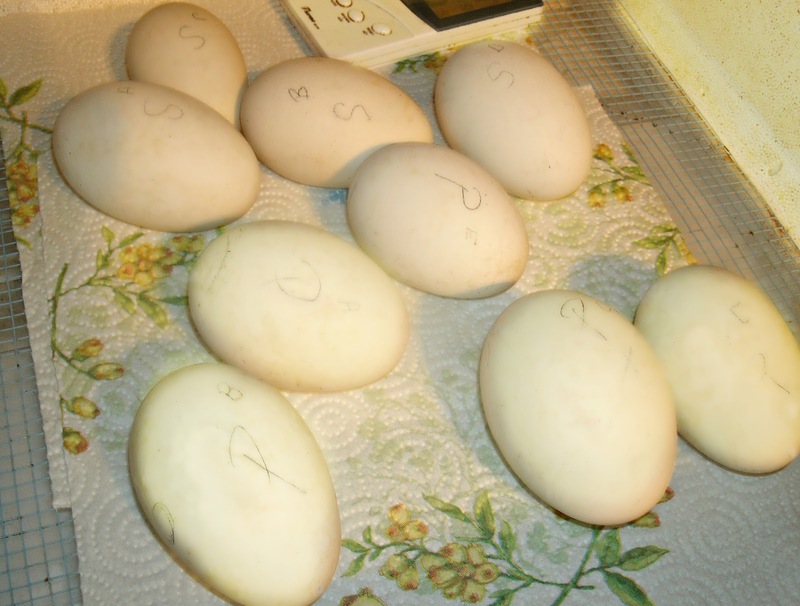 geese, hatchaholic, incubating goose eggs, Pilgrim, Sebastopols. My mother finally had one of her longtime wishes come true yesterday, and she couldn’t be more thrilled. Being a hatchaholic and a big goose lover, I’m excited, too. She has always wanted to add Sebastopol geese to the flock. You know, the beautiful eastern European geese with long curly feathers that almost resemble a ballgown. Every year, I’ve promised her that I’d purchase a few eggs and hatch them out for her, and every year I get so wrapped up in hatching our own eggs that I forget until after the breeding season is over. Maybe it’s the diet I’ve been on. . . all those hunger pangs and cravings have made my memory crystal clear. I seriously doubt it, but, anyways, this year my ever patient mother finally has her Sebbie eggs. We met a lady who owns a small farm, Broken Road Acres, and breeds Sebastopol geese. I had been contemplating having eggs shipped to us, but thank goodness, she lives just one county over and we were able to pick them up on Saturday. Even better, I finally have Pilgrim eggs, and they were put in the incubator today, as well. I had planned on buying eggs from another Pilgrim owner to place under our broody goose, Aubrieanne, but I ended up having to resort to another plan. These eggs were shipped and because there was a reservation list, I only just received them Friday. Needless to say, because I didn’t want her to have to wait that long for eggs, Aubrieanne is following Ben’s path and is setting on a few Toulouse eggs. By the way, Ben visits with Aubrieanne every day – I suspect to give her a little advice and perhaps a pep talk. Previous post: Spring has sprung. Next post: First Pea Eggs! I am SO envious Shell!!! We’ve no room in our small garden for any poultry other than our 8 chickens, but I would love ducks and geese – especially Sebastopol geese. The moment they hatch we need pictures, plus more pictures as they’re growing up please.